Audi Sport CEO Michael-Julius Renz: "TT RS shows even more of its strength." Neckarsulm, February 6, 2019 – Audi Sport hones the top model of the TT Model series with an even more dynamic look with power to match. Its five-cylinder engine delivers 294kW, accompanied by the unmistakable five-cylinder sound. The new TT RS is now available to order in Europe in both Coupé and Roadster configuration, with an Australian launch expected before the end of 2019. "The new TT RS is in absolute peak form," says Michael-Julius Renz, CEO of Audi Sport GmbH. "Like a well-trained athlete, it showcases even more prominently how much power lies beneath its muscular outer skin." Oliver Hoffmann, Technical Managing Director of Audi Sport GmbH, adds: "The outstanding performance is achieved by the low weight, the maximal athletic tuned suspension, and our award-winning five-cylinder. We have received the sought-after "International Engine of the Year Award" with the 2.5 TFSI engine for the ninth time in a row." The TT RS has never been this masculine, with a completely redrawn front end and the striking rear end giving it an even more dynamic appearance. The quattro logo in a matt titanium-look is positioned in the lower section of the gloss black grille with its matt black Singleframe, with enlarged lateral air inlets, divided by vertical strips on the inside and outside. For cooling purposes there are additional radiators located behind the typical RS honeycomb grille, and the lateral air inlets that extend almost all the way to the front wheel wells make the new TT RS appear even wider than before. A continuous front spoiler that is drawn up steeply at the lateral ends pulls the front apron down sharply, giving the car its distinctive, motorsport-inspired look. The blade is painted in body colour as standard, but is also available in a matt aluminium look or gloss black. The RS model has a gloss black inlay in the newly designed side sill and the exterior mirror housings are available in body colour, matt aluminium look, gloss black, and carbon. At the rear, it is the newly designed fixed rear wing with side winglets that catches the eye, supporting the RS-typical performance and efficiency. There are vertical design elements on both sides above the new RS-specific diffusor and two large oval exhaust tailpipes create the typical RS finish. LED headlights are standard. The optional matrix LED units regulate the high beams intelligently and with great flexibility, while optional matrix OLED reversing lights (organic light emitting diode) with a 3D design distribute their extensive light with extreme homogeneity and precision. When the ignition is switched on, the OLED reversing lights put on a spectacular display, and there is also a new red 12 o'clock marking on the steering wheel rim. The new TT RS is available in eight different colours, including the new RS-specific colour Kyalami green and the new colours Pulse orange and Turbo blue. Upon request, matt aluminium and gloss black styling packages highlight the blade and rear wing. The gloss black styling package includes the Audi rings and the TT RS model logo in black on the front and rear as an option. The fabric top of the TT RS Roadster is black and the Audi exclusive program offers numerous additional possibilities for individualisation. 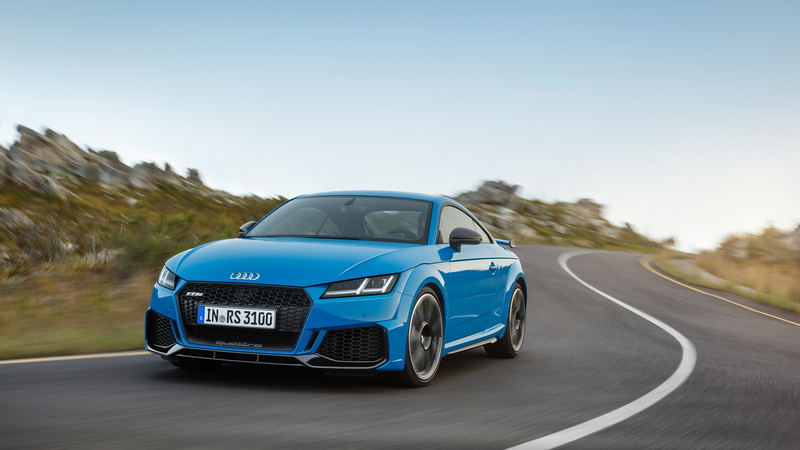 Five-cylinder, 294kW output, 480Nm of torque, quattro all-wheel drive – the Audi TT RS impresses with inner values and offers an outstanding driving performance. The Coupé sprints from 0 to 100km/h in only 3.7 seconds. Musical accompaniment is provided by the typical five-cylinder sound: 1-2-4-5-3. Due to this ignition sequence, ignition alternates between adjacent cylinders and those far apart from one another. This unique rhythm is music to the ears of many horsepower purists. Last year, Audi Sport received the sought-after 'International Engine of the Year Award' for the 2.5 TFSI engine for the ninth consecutive time. The turbo engine draws its power from an engine displacement of 2480 cm3 and the engine's maximum torque of 480Nm is available between 950 and 5,850rpm. The top speed is regulated to 250km/h or an optional 280km/h available to customers. The drive of the five-cylinder engine flows via a seven-speed S tronic to the quattro permanent all-wheel drive that distributes the power as needed between the axles via a multi-plate clutch. Wheel-selective torque control makes handling even more agile and safe and the driver can use the Audi drive select dynamic handling system to influence the quattro drive and other components such as the steering, S tronic, engine characteristic and exhaust flaps. The four modes available for this are comfort, auto, dynamic, and individual. The low weight (1450kg, TT RS Coupé without driver) and the consistently sporty suspension provide the basic prerequisites for the excellent handling of the Audi TT RS. The progressive steering adapted specifically to the RS ensures close contact with the road. At the front axle, ventilated and perforated steel discs are in action behind the 19-inch or 20-inch wheels, while the brake calipers are painted black as standard, but are available in red as an option. In addition, the RS sport suspension plus is available as an option with adaptive dampers in Audi magnetic ride technology. Their control technology is also integrated into the Audi drive select dynamic handling system. The low weight (1450kg, TT RS Coupé without driver) and the consistently sporty suspension provide the basic prerequisites for the excellent handling of the Audi TT RS. The progressive steering adapted specifically to the RS ensures close contact with the road. At the front axle, ventilated and perforated steel discs are in action behind the 19-inch or 20-inch wheels. The brake calipers are painted black as standard, but are available in red as an option. In addition, the RS sport suspension plus is available as an option with adaptive dampers in Audi magnetic ride technology – this control technology is also integrated into the Audi drive select dynamic handling system. Controls and display in the new TT RS are focused completely on the driver. The RS sport seats with the rhombus pattern in Alcantara or optionally with a honeycomb pattern in fine Nappa leather as well as the RS logos on the seats, steering wheel, door sill trims, and selector levers underline the sporty character of the 2+2 seater. Special RS displays in the standard Audi virtual cockpit with a 12.3-inch screen provide information on tyre pressure, torque, and g-forces. In manual mode, the shift light display prompts the driver to upshift when the maximum engine speed is reached. In addition to multifunction buttons, the RS sport leather steering wheel with shift paddles features two satellite controls for turning the engine on and off as well as the Audi drive select dynamic handling system. The new RS design package adds red or blue highlights to the car on the air vent doors, the seat belts, and the floor mats with the RS logo, while the extended RS design package also offers contrasting design elements on the seats and centre console. Audi also offers a great deal of infotainment features, with options that include MMI navigation plus with MMI touch including free text search and natural language voice control, as well as the Wi- Fi hotspot and the Audi connect online module. Online services reach the vehicle via the fast LTE standard, while the Audi smartphone interface connects smartphones with the TT RS and can stream content seamlessly to the Audi virtual cockpit via USB. The Bang & Olufsen sound system provides an unparalleled sound experience on board with an output of 680 watts. The all-new Audi TT RS is expected to arrive in Australia before the end of the year. Pricing and specification will be announced closer to launch. The new TT RS represents the pinnacle of the TT model range, melding iconic styling with extraordinary performance.